The system is suitable for all degrees of urinary incontinence, and can also be used after radiotherapy. 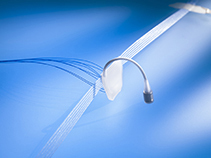 The integrated mesh arms are drawn back around to the middle of the implant to secure the system in place. This eliminates the need for additional fasteners or screws, and ensures a symmetrical 4-point fixation. Patients can urinate freely without having to activate a mechanical component. This means the ATOMS System is also suitable for patients suffering from dementia, or whose cognitive skills may be expected to regress over time. Patients with joint pain (e.g. gout) also benefit from not having to operate the system manually. The ATOMS System is made up entirely of components that function hydraulically. Patients are therefore spared the difficulties caused by defects which may occur in mechanical components months or years after the implantation. For more information on ATOMS click here.